One of the seven ancient wonders of the world, the great pyramids of Gizaare marvelous feats of architecture. The Giza complex consists of three large pyramids built for the pharaohs Khufu, Khafre and Menkaure. The grand structures were built between 2589 BC and 2504 BC. How they were built has been a source of debate. The pyramids are part of the Giza Necropolis that also houses the Great Sphinx, smaller pyramids for queens and several complexes for the workers. Historians agree there was an immense amount of labor involved; technical ingenuity and skill that went into the pyramids helped the structures remain standing today. Khufu’s pyramid, known as the great pyramid of Giza, is the oldest and largest, rising at 481 feet (146 meters). Archeologists say it was the tallest structure in the world for about 3, 800 years. The sphinx is a 73.5-meter (241 ft.) long monument built during the reign of Khafra. The creature is a mythical being commonly found in Greek, Egyptian and even South Asian ancient architecture. Khafre and Menkaure’s pyramids are much smaller and simpler in design than Khufu’s massive structure. When first built, the pyramids were covered in white limestone much of which eroded over the years. Contrary to popular depictions, the Egyptian pyramidswere not built by large groups of slaves or prisoners, many historians say. Egyptians were employed and archeologists estimate the workers would have had to set a 2.5 to 15 ton block every two and a half minutes to finish Khufu’s pyramid in about 30 years. 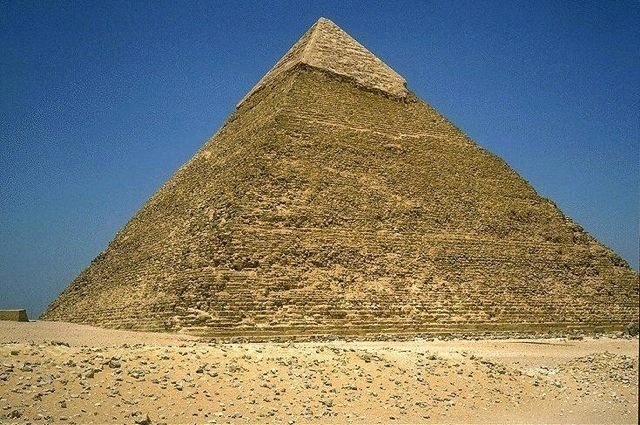 Historians say the purpose of the pyramids was to house the king’s body after death. The Giza pyramids have elaborate tunnel systems inside containing gold and other objects Egyptians thought would be useful in the afterlife.